Description: On the night of October 8, 2006, BNSF loaded coal train CJRMSLP130A (Jacobs Ranch Mine, WY - Smithers Lake Power, TX) entered an open switch on a spur track on the Boise City Subdivision which is Dark Territory. Train Speed was 29 mph at time of collision. Both crewmen recieved minor injuries. 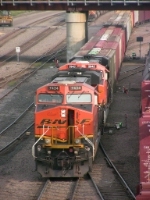 Description: Several of the new BNSF ACe's were sitting at MAC. There were also a bunch of the NREX B39-8E's there, as well as the BNSF 5942 GEVO, to the left of the ACe getting a new cab. Description: This unit was wrecked in Cactus, TX on 10-10-2006 while on a coal train. The derailment injured the 2 crew members in the cab. To see some wreck photos go to: http://www.railroadforums.com/forum/showthread.php?t=16081&highlight=Bnsf+Gevo+Destroyed , and for the story, go to: http://amarillo.com/stories/101106/new_5784123.shtml . They still have some work to do, but it's looking better. Description: Lined up out front were EMLX 8559 SD90AC, NREX 8599 B39-8E, and BNSF 5942 ES44AC. Description: Trailing out into the T yard is a clean looking BNSF Gevo. Description: A set of Gevos pull a small cut of cars out into the T yard to begin doing some switching. Description: BNSF #6264, and BNSF #5942 slowly pull through Kelso, WA on Jan. 8th, 2011 while an empty coal train after Amtrak 513 departed. Description: This unit was in a massive wreck down in Texas almost 5 years ago, The entire cab is new and prolly half of the LH panels as well. Description: A loaded ore train heads south through Litchfield, IL on its way to Granite City, IL. Description: An empty ore train heads westbound. Description: Not exactly sure why this one has fat cab numbers.